Senator Mark Dayton sent his state director to Paynesville last Friday to talk with senior citizens about Medicare's prescription drug cards. Jim Gelbmann met with ten seniors at the Paynesville Area Center to answer questions and provide more information on Dayton's stand on the issue. The Medicare Prescription Drug and Modernization Act provides a prescription drug benefit beginning on January 1, 2006. Until then, the bill allows seniors to choose one Medicare-approved card that would, in theory, save them an average of 25 percent on prescription drugs. Dayton voted against the bill last year because he felt it had too many problems. For example, the card premium is not fixed, Gelbmann explained last week. The enrollment fee per month starts at $35 and only rises. Dayton would like to see a stabilized price. Also, if one spends between $250-$2,250 per year on prescription drugs, the federal government will pay for 75 percent of the cost. But, if you spend between $2,250-$5,100 you pay 100 percent of the cost, and you still pay the card premium per month even though you aren't getting any benefits from it, Gelbmann added. Jim Gelbmann, Senator Mark Dayton's state director, visited with local senior citizens last Friday about perscription drug cards. Senator Dayton has proposed two changes to the law, but neither has passed yet. One provision is called the "Taste of Our Own Medicine" amendment. This would prohibit members of Congress from receiving better coverage than Medicare recipients. Dayton feels that the prescription coverage that seniors get is inadequate, especially when compared to what members of Congress get. Dayton's other amendment is called the "Unshackle Seniors Act." This proposal authorizes seniors to purchase as many drug discount cards as they desire. Dayton's law would also allow seniors to forfeit their card if it no longer carries their prescription. Right now, drug companies can remove any medication at their own discretion, even though the consumer would still be stuck with their card. 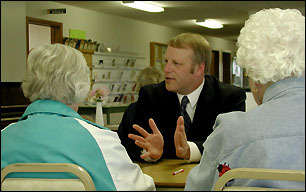 Seniors at the Paynesville Area Center voiced their concerns to Gelbmann so he could relay them back to Dayton. Elaine Houske of Paynesville described her strong feelings about the unfairness of the new law. "It's ridiculous," she said. "We should be able to get our prescriptions for the same price as Canada and Mexico." Senator Dayton sponsors bus trips to Canada to demonstrate that many seniors can't afford to buy their prescriptions from their local pharmacies. "It's sad that we are the most powerful nation in the world and we can't give our seniors a reasonable drug price," Gelbmann said. Getting nods of agreement from many of the seniors at the meeting last week, Houske reported spending over $400 per month on insurance and $200 on medications. It's outrageous, she said. According to Houske, the government should be negotiating prescription costs with pharmaceutical companies like they do with veterans' prescription. Gelbmann reported that Dayton will continue to put pressure on Congress to come up with a better law. While changes aren't expected this year, Dayton hopes for dramatic changes in 2005. While Gelbmann was in town, he also met with the incoming and outgoing superintendents, Todd Burlingame and Howard Caldwell, at the Paynesville Area School District.